SOI will flip positive next week. A low disturbance is expected to form near Darwin, causing lower than normal pressures there and normal pressures will preside over Tahiti. In regards to MJO activity: Mike Ventrice and Carl Schreck's hovmoller graphics which utilize data from the Euro, GFS, and CFS continue to show -VP200 anomalies centered near the dateline. Past 5 runs of the operational Euro show continue to show these -VP200 anomalies remaining near the dateline for the next 10 days. 1. This is assuming that the buoys are correct and that the PENTAD analysis is wrong. 2. 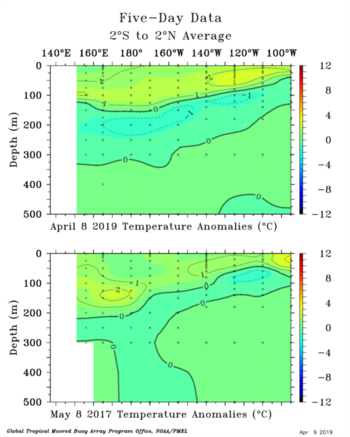 If the buoys are correct then that means the El Nino has pretty much peaked (though there's enough OHC to maintain El Nino status until the early summer) and we'll need to see if a new downwelling Kelvin wave can restrengthen the event. So TAO has missing data, so is likely too cool. 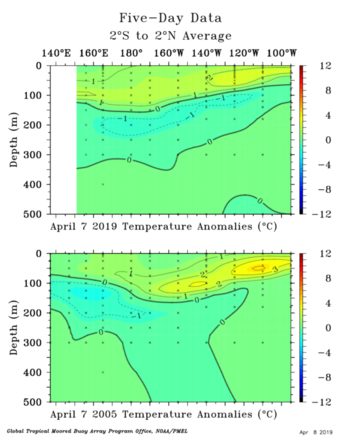 That GODAS CFSR graphic you posted on twitter is much warmer than the buoys but also shows too much unrealistic upwelling in the WPAC during February and March. Ooh I just looked at it again, it's a comparison between the 3. My bad. Interesting that GODAS is so cool. oh, I just realized that I never posted it. I remember 2015 had cool anomalies west of the dateline. So just gotta wait and see. CPC weekly update of 4/8/19 has Niño 3.4 is down to +0.9C. Niño 1+2 is at dead neutral 0.0C. 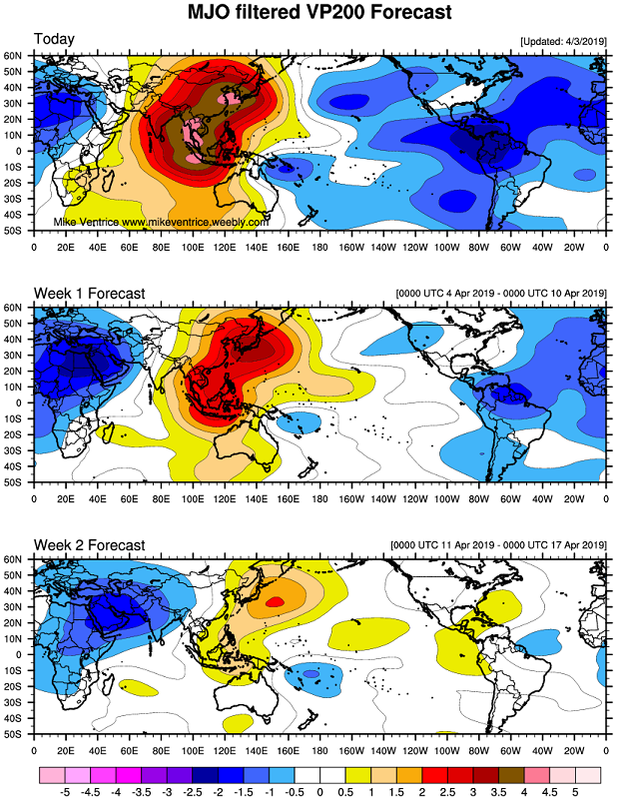 cycloneye wrote: CPC weekly update of 4/8/19 has Niño 3.4 is down to +0.9C. Niño 1+2 is at dead neutral 0.0C. SOI can be very noisy. Euro has it tanking in 48-72 hours. 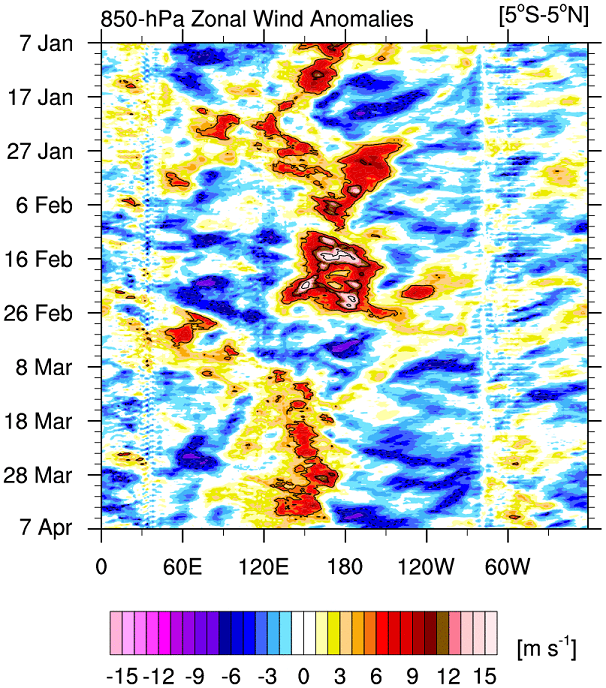 The base state continues to be fully coupled with El Nino as evidenced by the zonal wind activity within the last 3 months. Last edited by Kingarabian on Tue Apr 09, 2019 3:25 am, edited 1 time in total. 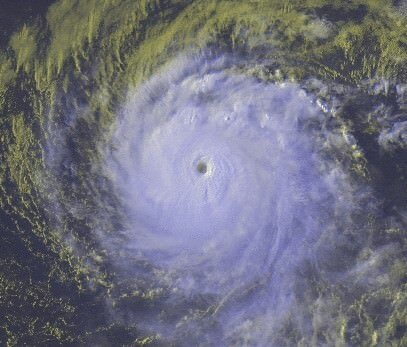 I think some people are pulling the trigger and El Nino cancelling just a little too soon, same way some season cancel too soon for the Atlantic when it's only June/July. I'm not trying to criticize or call anyone out, so I hope no one takes it that way, it's just something I've noticed the past couple weeks. Seems opinions on the upcoming season and El Nino are swinging wildly due to the fact the Nino is experiencing a little blip. 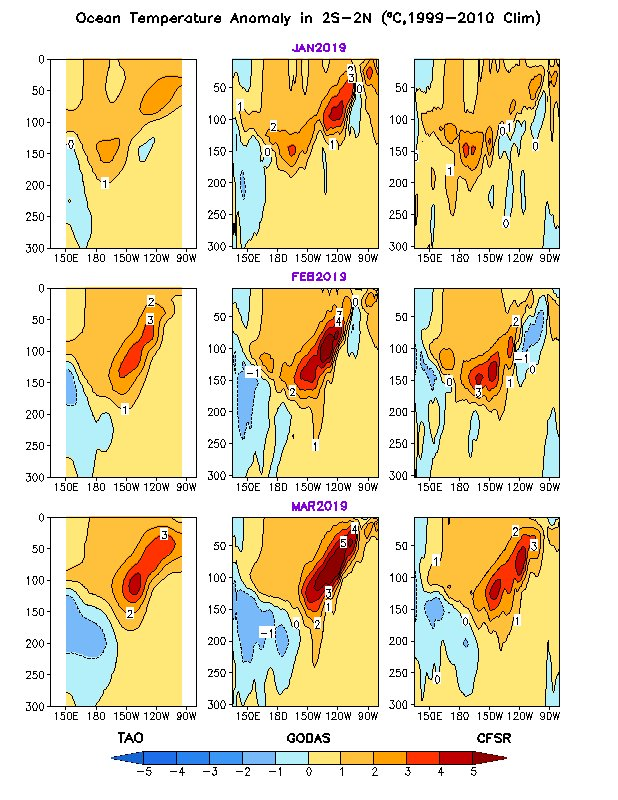 Discrepancies in subsurface analysis make it look like the warm pool might not be as strong as initially thought a couple months ago, but I think we're still in a place where there's a large variety of potential outcomes. I think a super Nino is very unlikely, more so than it looked a few weeks back, but I think there's still potential for a moderate/ strong Nino or maybe we are at the start of a weakening trend and it'll die off by the fall or possibly sooner. I think we need more consistency in current trends though before we can start to feel more confident in those trends lasting over a significant amount of time. The daily SOI is probably a little more noisy than usual due to the fact Wallace formed closer to Darwin a few days ago and is now moving away, and there's also an invest over that way right now firing some convection and lowering pressures. I do enjoy watching the daily SOI as well, but it's safer to stick with the 30 and 90 day averages when looking for trends and long-term effects. No skill in forecasting before the spring barrier, so up or down it's all interesting speculation until early / mid May. Following post is based on the TAO buoys and could be erroneous as the buoys are missing key data. But say the TAO buoys are correct, at the subsurface, we're at the stage where we can go ahead and discount 2010 as an analog. However 2017 and 2005 are right in the mix.